Pacesetter Long Slow Distance (LSD) was scheduled on 5th Feb 2012. While most of runners were running HK marathon, Bukit Aman Car Park still have a lot runners. While it's been a while since my last LSD (feel guilty), I paced with Uncle Tai for 19.88KM. Water stations were set up at KM 5 and KM 10 mark. Never thought i have chance to meet and chat with Azran. 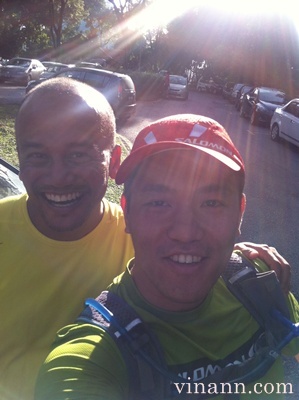 Thank you Azran for your wish on my HK100 ultra race. With Air Asia X CEO Azran Osman Rani. Congratulation on Air Asia Japan ! More Air Asia X flights to Japan will be introduced in August 2012. Gold Coast Airport Marathon @ 30 June - 1st July 2012 ! Have you secured your slot and Air Asia X flights? Vibram Hong Kong 100 - I'm a finisher !